Providing education and regulatory preparation services for healthcare by conducting training, facility and life safety surveys with supporting document review (Joint Commission, CMS, OSHA, EPA). 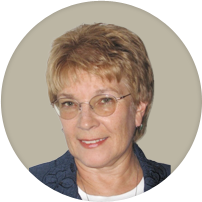 Whether you want a second opinion, additional education or coaching, Marge can help. Marge is the author of multiple handbooks, training manuals, and checklists. Marge prepares customized presentations across the United States in person and through webinars. Marge McFarlane brings over 40 years of comprehensive experience in the environment of care, life safety, emergency management and infection prevention for construction. She is currently working with healthcare systems nationally to identify and mitigate risks in the physical environment. McFarlane has authored handbooks on the GHS update to the OSHA Hazard Communication Standard, OSHA training for Medical Facilities and is a frequent presenter for seminars, regional conferences, and audio conferences. We completed the online OSHA safety training today as a small group. We each registered so that we would get our certificates of completion. We really like the format because we could pause the session and discuss the information specifically as it applies to our small facility. Nice presentation! Thanks. Miron Construction engaged Marge McFarlane to collaborate with us on the creation and launch of our new Healthcare Construction Handbook, a reference tool for our Project Managers, Superintendents, and Foremen who work in new or existing healthcare facilities. Working with Marge was an extraordinary experience. Not only did she offer her wide experience of Infection Prevention and best practices, she integrated her knowledge with Miron’s existing policies and procedures to create a truly unique product. The creation of the manual was not the end of the journey for us. Marge then introduced the manual to our staff and with her real life examples of the risks of working in healthcare facilities--she helped our field staff understand the true complexity of their work. I would recommend Marge to any individual or group that wants to raise their awareness of the inherent risks of healthcare construction and how to mitigate them. We tried to implement a formal program for several years and had only limited success. Without Marge we would never have achieved the goal we did. We and our clients and their patients are all better due to her efforts. Rob Chartier, PE, Vice President of Healthcare - Miron Construction Co,. Inc.
Marge McFarlane was incredibly knowledgeable and helpful throughout the education process. She was able to explain the importance of infection prevention and interim life safety processes to Facilities Maintenance Technicians, Healthcare Contractors, Quality & Safety personnel, and Infection Preventionists. Marge’s style of educating was effective yet entertaining. She answers all questions promptly and in a manner that is clear without being patronizing. We have organized numerous training sessions throughout our system and I’ve received many compliments on her presentations from the staff. I would highly recommend Marge McFarlane to any facility or organization looking to educate and improve employee awareness on the importance of infection prevention and interim life safety for day to day maintenance, repairs as well as construction. I have known Marge McFarlane for over 25 years, and it is rare to find an individual as experienced, knowledgeable, conscientious, and reliable as her. One of the things that makes Marge amazing is her ability to accurately recall environment of care, interim life safety, emergency preparedness, and other safety requirements--she is a walking safety database. Another valuable asset is Marge’s speaking skill. She can make a topic that could be dry and boring into an entertaining and memorable presentation. I whole-heartedly recommend Marge McFarlane. Hospitals are built to “defend in place.” Managing facilities is a challenging and ongoing proposition. I provide an extra set of eyes to help identify opportunities for improvement and strategies for managing those opportunities. Services include facility tours, life safety plan and document review, interim life safety staff education, and associated plans for improvement as well as assistance in developing a prioritized list for implementation. Services include Environment of Care plan reviews for safety and security, hazardous materials and waste, fire response, medical equipment and utilities; selection and tracking of performance indicators, review of the annual evaluation of effectiveness and assistance with documenting risk assessments. CMS published new emergency CoPs in 2016. All facilities are expected to be in full compliance by November 2017. Hospitals are structured to provide very good care every day. There are times when there is a rapid increase in the demand for services. Emergencies may be handled by the resources on hand or with the need for additional resources. Everything gets accomplished but at a quicker pace. Disasters may require significant amounts of external resources and coordination and every need may not be met. Emergency management is the process of planning for and mitigating (reducing the impact of) internal and external events that may require additional resources. Emergency response is the activation of pre-planned processes to respond to and recover from internal or external events and to restore the day-to-day operations of the hospital. Exercises, drills and actual events are ways to test the current emergency capabilities related to communications, the allocation of resources, staff roles, safety and security, utilities and patient care and staff support. After action reports identify strengths to be maintained and opportunities for improvement. Services include tailored checklists for exercise design, Emergency Management Committee education, exercise evaluation and after action reports with opportunities for improvement and periodic assessments for completion and sustainability of the improvements. A mock survey follows the agenda of regulatory surveys. Joint Commission mock surveys use the life safety document review and facility tour to assess compliance with the standards and elements of performance. The mock survey includes an Environment of Care and Emergency Management session for coaching and plan review. The EOC plan reviews include each of the management plans for safety and security, hazardous materials and waste, fire response, medical equipment and utilities well as the annual evaluation of effectiveness. CMS mock surveys include life safety document review and facility tour to assess compliance with the Conditions of Participation. The mock survey includes a session for coaching staff in the Conditions of Participation, the expectations for federal surveys and mitigation strategies for the opportunities for improvement identified. Infection prevention for construction has evolved from “just for” large construction and renovation projects to include a required risk assessment for maintenance and small projects. These small projects may fly under the radar of the facility planning and construction committee but may impact vulnerable populations, even if only for a short period of time. Services include staff and contractor education as well as strategies for and preparation of risk assessments, monitoring of projects related to the project and document review. This document can be used as an infection prevention risk assessment for maintenance and repairs. OSHA regulates worker safety, CMS (Centers for Medicare and Medicaid) controls reimbursement for safe patient care, treatment and services and the EPA (Environmental Protection Agency) regulates hazardous waste. Healthcare is faced with complying with the complex and sometimes conflicting regulations from these federal agencies. Services include navigation of the regulations and a gap analysis to ensure that all elements of compliance are addressed. Marge provides education and regulatory preparation services for healthcare by conducting training, facility and life safety surveys with supporting document review. Identify specific methods to train staff, identify hazards, and document assessments to become a highly effective safety professional. Written for medical and dental offices and healthcare facilities of all sizes, this handbook includes a downloadable Hazard Communication plan template that is easily customized.